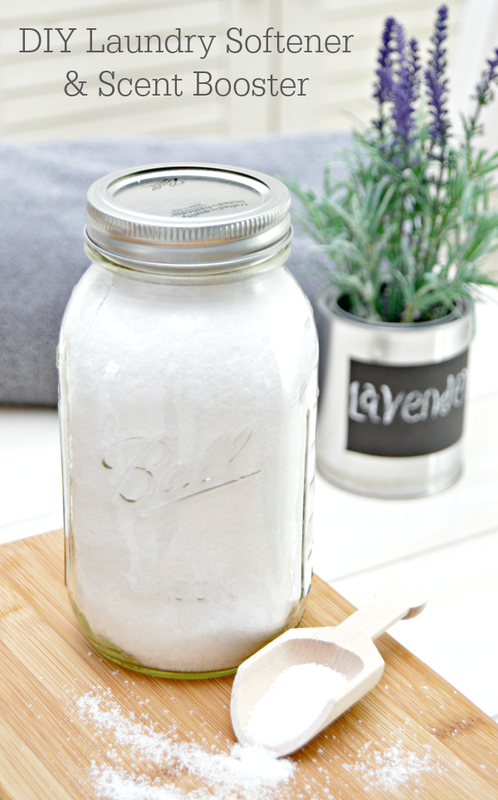 I am so excited to share my 2 Ingredient DIY Laundry Scent Booster and Softener recipe! If you are a long time reader, then you know that I have been making most of my own laundry detergents, fabric softeners, dryer sheets, and stain removers for quite a while now. 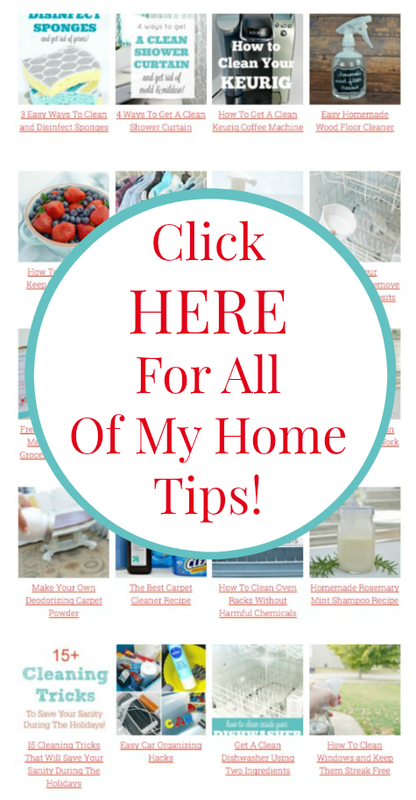 You can find them all on my Home Tips Page by the way! This scent booster will not only leave your laundry smelling super fresh, but will also soften it as well. All you need is kosher salt and essential oils. This recipe honestly is the easiest thing you could possibly make. The salt works to soften your water and clothes while the essential oils provide a soft clean scent and help lift away grime and dirt. You can find my favorite Lavender Essential Oil HERE! Start by adding a 3lb. 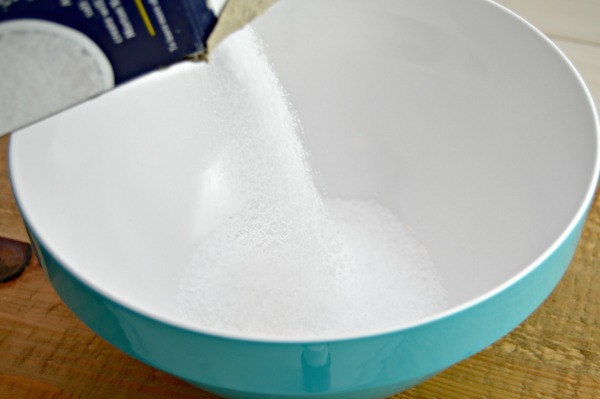 box of kosher salt (you can substitute with epsom salt or table salt) to a large bowl or container. Next, add 20-25 drops of lavender essential oil. You could use lemon, lemongrass or peppermint instead if you don’t love lavender. 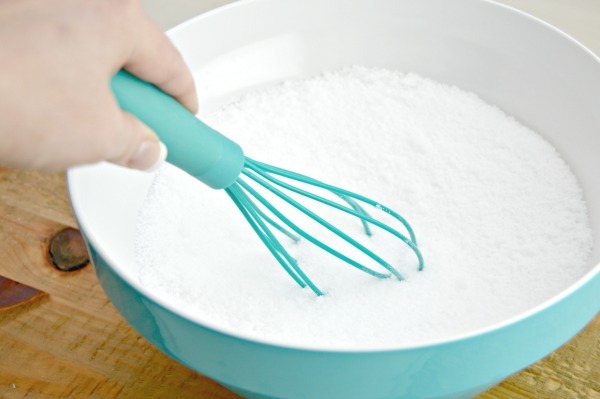 Whisk together, making sure to spread the oils throughout the salt. Now place your laundry scent booster and softener in an airtight container. I love large Half Gallon Mason Jars for storing mine. To use in your laundry, simply add 1/2 cup of your homemade scent booster to your laundry and wash as usual. This formula is safe for HE washers, and the essential oils will not come out of your dryer smelling super strong, it will simply give your laundry a boost in scent. It also doesn’t smell girly, just fresh and soft! For more home tips and cleaning tricks, visit my Home Tips Page HERE or by clicking the photo above! Neat…I’m going to try it. I already make my laundry detergent and it has Fels Naptha soap in it which has a strong odor, but I am going to try this to see if the pretty lavender scent will stay in the clothes. My husband cannot tolerate scented fabric softener so I will add this to his loads…because I want them to have a pretty scent as sometimes some of mine get combined. It’s just a type of salt…any salt will work! After doing a little research, I’m finding that most salts will work, so I’m changing the post to reflect that. Hope this helps! I love this idea, but although I have bought Kosher salt before, I cannot find it in any walmart, or Sam’s Club. It is listed on the website, but not in my area. Can I use Epson Salt instead? Thanks. Epson salt will work too. After some research (since some places don’t carry Kosher salt), I have found most salts will work for the homemade recipe. I’m changing the post to reflect that. Hope this helps! Recipe for liquid fabric softener? As our washer indicates only use liquid detergent and softeners! Love all DIYS and save $$! Thank you for sharing all your tips! Couldn’t locate link for liquid fabric softener. Really appreciate all your input and sharing. Thank you! Hi, Is it okay if I use Epsom salts with the Lavender scent and omit the Lavender essential oil? Will I get the same effect? I do this with Vanilla scented Epsom Salt. It is more subtle, creating an almost neutral scent. I love this! 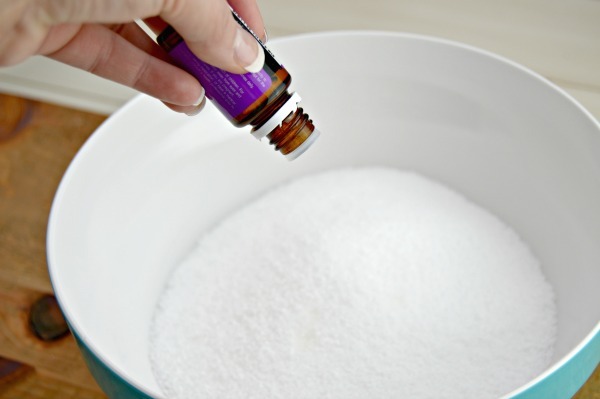 I have been looking for a do-it-yourself laundry scent booster and this one is so simple and fresh. I recently started making my own laundry detergent and dishwashing detergent with home natural products and this is a perfect addition. Thank you very much for posting this. So you are a recipe calls for Epsom salt and essential oils and I believe I read in a comment somewhere that this is a liquid fabric softener. Am I supposed to add more water to it? To make it more liquidy?